Choosing which card to play when you are making the opening lead is one of the fundamental skills that all bridge players need to learn. In this article we are going to look at which card to lead if the bidding has ended in a No Trumps contract. The bidding gives you some clues to help you decide which suit to lead. If your partner has bid a suit, then you should lead that suit unless you have a void (no cards in that suit). If your partner didn’t bid at all, then look at the other team’s bidding. Choosing a suit that they haven’t bid is a good option. Usually you would lead from the longest unbid suit in your hand. Once you’ve decided which suit to lead you then have to decide which card to lead. 1) Top of a sequence of three. If you have a sequence of three cards headed by an honor card (an honour card here is an Ace, King, Queen, Jack or Ten) then play the highest card in the sequence. For example – if you hold A, K, Q then play the Ace. If you hold J, 10, 9 then play the Jack. If you hold 10, 9, 8 then play the 10. 2) Top of a “near sequence” of three. A “near sequence” is just a sequence with a card missing between the second and third in the sequence. For example A, K, J or Q, J, 9. Here you also play the highest card in the sequence. So in the first example you would play the A and in the second example you would play the Q. If you have an interior sequence, for example A, Q, J or Q, 10, 9 then lead the top of the interior sequence. Here you would lead the Q in the first example and the 10 in the second example. An easy way to remember which card to lead in all of the above is to lead the highest of the touching honours. If you have a sequence of just two honour cards, then lead the fourth highest card in that suit. For example, if you hold K, Q, 8, 7, 3 then lead the 7. Likewise, if you have just one honour, lead the fourth highest card. For example, if you have Q, 8, 6, 5, 3 then lead the 5. If you are leading from a suit that doesn’t have an honour card, then lead the second highest card. So, if you hold 9, 8, 5, 4 you would lead with the 8. 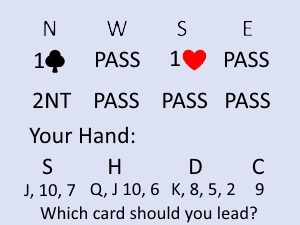 Now that you know how to decide which card to play if you are making the opening lead, go to No Fear Bridge. Sign up for your two weeks’ free trial and choose the leads practice exercises.